Much has been written about Helene Hines. This is the first book where she speaks for herself, so that we may know her voice and thoughts also. An able athlete in high school, she discovered in college that she has a neurological problem that revealed itself when she was 30 to be MS. 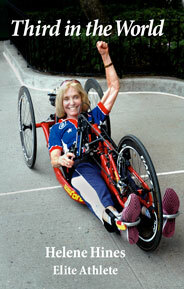 Using her innate and practiced athletic ability, Helene learned to walk again, then run, and finally race in marathons. When she could no longer use her feet effectively, she turned to the hand-cycle and became third in the world in her class. Defying expectation, convention and authority, she persisted relentlessly, to claim a place in the Jewish Hall of Fame, and to become a determined teacher, improving the lives of others with her same ailment. With her husband of 41 years, she has raised two children with their own talents. Helene grew up in a suburban resort in her grandmother’s care, enjoying a charmed life as a charming youth. Her love of sports led her toward a teaching career. In her final year of college she experienced an unexplained paralysis, that left, only to return at 30 and cripple her systemically. With fierce determination and the help of her husband however, she slowly recovered. Told she would never walk again, she soon was running in marathons and winning in her class. She has gone on winning, challenging herself with ever more difficult races. Enjoying her success, she now tells her inspiring story in this autobiography.